to take me, I've always thought the mysteries of haute sushi dining is most likely out of my reach because at that level, the interaction between the sushi chef and the customer is so important (and as it turned out, it did prove to be a problem this time). Plus, I am more than satisfied simply trying the multitude of affordable dining options in Tokyo. The relief on my wallet (in an otherwise expensive city) is a welcomed side benefit. I still don't know any local foodie (or anyone, period, who lives in Tokyo, actually), but I decided it's time for me to dip my toes into the realm of fancy Tokyo sushi joints. For my first foray into this world, I decided upon Kyubey (久兵衛), supposedly one of the most famous sushi restaurants in all of Japan. 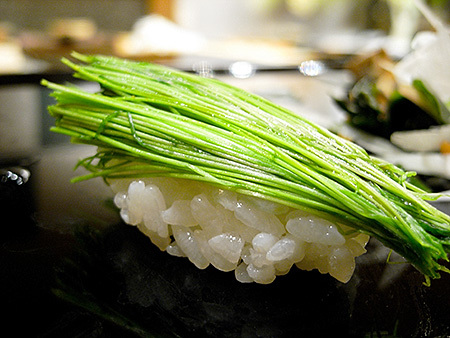 Incidentally, they are the inventor of gunkan-maki ("battleship wrap")—the technique of wrapping sushi with a loose topping like ikura or uni with a strip of nori. I figured since they are that well known, they are likely as equipped as anyone to deal with foreigners.